Edvard Hagerup Grieg is Norway's greatest composer. Although his style was shaped by the Norwegian folk spirit, it assimilated German romanticism and even anticipated features of French impressionism. Edvard Grieg was born in Bergen on June 15, 1843. His father was a merchant; his mother, a talented musician, gave Grieg his first music lessons. At 15 he was sent to the Leipzig Conservatory, where he studied under the leading German academicians of the day. An attack of pleurisy in 1860 destroyed one of his lungs and undermined his studies, and in 1862 he quit Leipzig for good. Though Grieg looked back with loathing upon this phase of his life, his music often showed the influence of the Leipzig tradition of German romanticism. In 1863 Grieg went to Copenhagen to seek advice from Niels Gade, the leading Scandinavian composer. Gade commanded the young Norwegian to compose a symphony—an uncongenial task over which Grieg toiled for a year, producing a stilted work he soon repudiated. In Denmark, Grieg met the two most influential people in his life. One was his first cousin, Nina Hagerup, whom he married in 1867. A gifted singer, she became an important influence on his vocal composition, as well as the beloved companion of his life. The other was Rikard Nordraak, another blossoming composer, who had developed a passionate enthusiasm for Norwegian folk culture. This was the period when cultural leaders were attempting to throw off the bonds of the Danish-oriented language and thought dominating Norwegian life, and in which Grieg had been raised. In its place they hoped to create a new national language and literature based upon Norwegian peasant traditions. In 1865 Nordraak and Grieg were among the founders of the Euterpe Society to promote the performance of new Scandinavian music. Nordraak died the following year, and Grieg dedicated his orchestral overture In Autumnto him. Nordraak roused Grieg from his essentially Germanic orientation and awakened him to the possibilities of developing a new, distinctly Norwegian musical style. This new direction was more clearly displayed in the next few years, during which Grieg became musical director in Christiana (later Oslo), where he established his residence. The first of his 10 books of Lyric Pieces for piano appeared in 1867; in them Grieg achieved his first fusion of Felix Mendelssohn's keyboard-miniature style with a Norwegian character. In 1869 Grieg was soloist in the original version of his Piano Concerto. Stage music for BjÃ¸rnstjerne BjÃ¸rnson's Sigurd Jorsalfar (1872) was followed by an abortive attempt at an opera. But collaboration with the dramatist Henrik Ibsen produced his famous music for the play Peer Gynt in 1876. During the late 1870s Grieg became subject to ill health and to the fits of depression and inactivity that plagued him chronically thereafter. Though rapidly acquiring an international reputation and becoming his nation's leading musician, he was troubled with doubts about his "national" music and began to seek more "respectable" expression with such works as his String Quartet in G Minor (1877-1878). Nevertheless, his love of the Norwegian countryside and his commitment to Norwegian art persistently reasserted themselves. Grieg built a house at Troldhaugen in 1885 and there passed his later years almost entirely in composition. From this last period came such works as his Norwegian Dances (piano duet 1881, later orchestrated), his Holberg Suite (piano version 1884, orchestrated 1885), the Haugtussa song cycle (1896-1898), the Symphonic Dances (1898), and numerous songs and piano pieces. Yet, with his urge for formal achievement unsatisfied still, he continued to compose chamber works, such as the last of his Sonatas for Violin and Piano, in C Minor (1886-1887), and another String Quartet (begun 1892; unfinished). 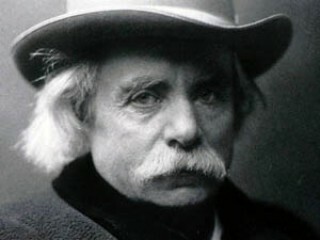 His nerves badly strained and his health ravaged in his closing years, Grieg died on Sept. 4, 1907, and was paid final homage in national mourning throughout Norway, which had achieved its independence only 2 years before. While remembered outside Norway mainly for his orchestral works, Grieg was highly esteemed in his day for his piano music. But his most unique and perfect achievements were probably his songs, especially those set to Norwegian verse. View the full website biography of Edvard Hagerup Grieg.